It’s difficult not to be in awe of the Budge sisters from Bigton. Kirsty and Aimee, who are still just in their early 20s, farm 350 hectares of land on the west coast of the Shetland mainland, and take in their stride the challenges of the island’s climate, the long dark winter days, remoteness from markets and the unpredictable and crippling expense of freight. In all of that they are no different from the rest of Shetland’s resilient producers – indeed the light Bigton land is better than most on the islands and makes the outwintering of some stock possible. 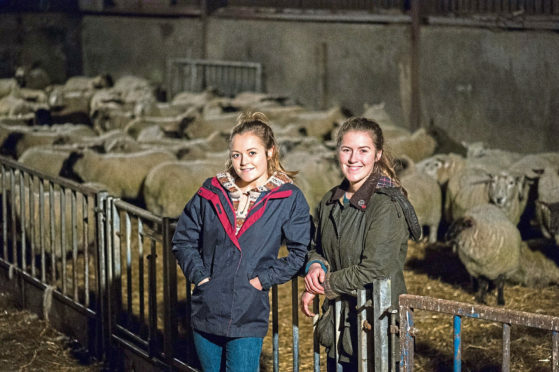 What singles out the young women is the responsibility for the farm they took on their shoulders in the wake of their father Bryden’s tragic death in a tractor accident four years ago, together with their driving ambition to make a difference to the future of agriculture in Shetland. To that end they became the islands’ first Monitor Farmers, hosting trials, pioneering ideas and holding informative meetings which attract dozens of crofters and farmers to Bigton every two months. Aimee explained that the aim was to improve efficiency and get the most from the land. She said: “We’ve already had barley trials which looked at resilience, and we’ve started rotational grazing which is a new process on Shetland. The Budge family has been farming the land at Bigton for five generations and it’s clear from speaking to Kirsty, Aimee and their mother, Helen, that continuing and honouring that legacy was never in question. Kirsty was reaching the end of a teaching degree in Aberdeen when her father died but she didn’t hesitate in refocusing her life and committing to the farm. Aimee, who has just won the accolade of Agricultural Student of the Year at the 2018 British Farming Awards, had always intended to study agriculture and says it was a natural decision to carry on her father’s legacy. She studied for three years at Craibstone and juggled learning with helping run the business, taking part in the Monitor Farm project and getting experience on other farms in Aberdeenshire. She has now returned home full-time and shares the responsibility for the business with her older sister. Their grandfather, Jim, a stalwart of the farmers’ union, has been generous with his support and advice, and their mother, Helen, was equally determined to ensure the farm would survive. It goes without saying that she is proud of how her daughters have stepped up. She said: “They were faced with real tragedy when they lost their dad and they’ve been willing to not just take on the farm but are already beginning to look at developments and make things better and keep up with the times. “Certainly when I was their age I couldn’t have taken on what they’ve done and learned so many new things in a short time. Helen acknowledges the high profile her daughters now have is helping fly the flag for women in agriculture across the country. She said: “Women were always involved but traditionally they got the menial tasks. The entire Budge family acknowledges the publicity generated by the Monitor Farm meetings, television interviews and the Farming Heroes award means many people are now familiar with their story, which means they have a lot to live up to. However, Helen believes that their resilience has helped others who are also going through tough times. She said: “I think it shows that when you have such tragedy you can keep going and can manage things. “Others have been inspired… and the lasses have demonstrated you don’t just keep going, but you can develop things. * The Budge sisters will feature in BBC Radio 4’s On Your Farm programme tomorrow morning at 6.35am.